Katy was one of a litter of 10 puppies - 3 girls and 7 boys. She grew up when my time was limited since raising human kids was more important than showing my dogs. She did finish puppy class and start agility training. Katy competed in fun matches and a few shows as a puppy before becoming the house dog extraordinary for my oldest step-daughter. 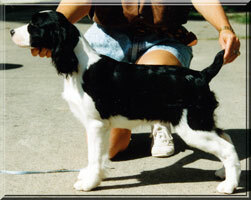 Katy was bred three times. 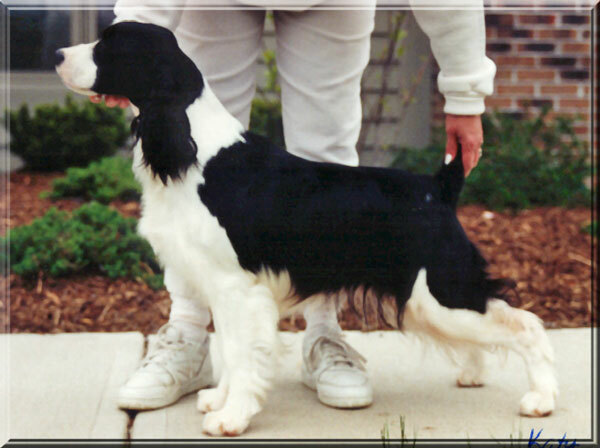 On October 16, 1998 she whelped a singleton puppy sired by U-Ag I Ch Brendael Midnyht Reflections CGC. Brianne is the puppy from this litter. 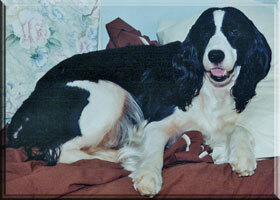 February 7, 2000 she whelped a litter of six puppies sired by A/C Ch Mystic's Just So. We ended up placing the puppy we kept from this litter. 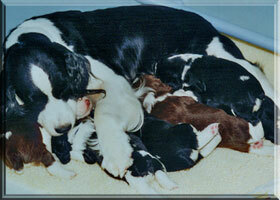 Last, on January 12, 2001 she whelped a litter of seven puppies sired by A/C Ch Mystic's Peridox TD. Hannah is the puppy we kept from this litter. 8 weeks old - evaluation time. All 10 of us went to Janice Miller's for evaluations. I'm the keeper. 4 mos 6 mos Padraic, Danna, and I got to go see santa. 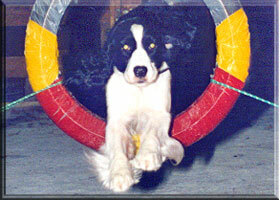 Going through the tire at agility class. Agility was a lot of fun, but I would rather stay home. Another Halloween Party. 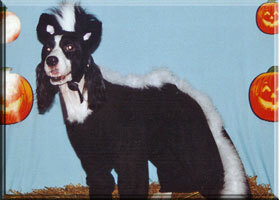 This time I'm dressed as a skunk. It is kind of fun to get dressed up. Taking a break from puppies. I stole mom's bed. 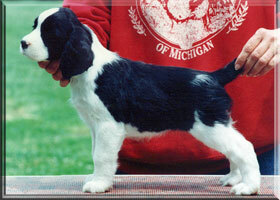 Six three-week-old puppies sired by Kip. I finally have this puppy business down. 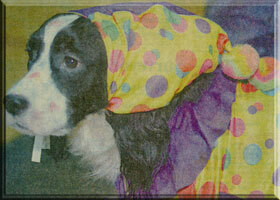 MOTC halloween party, mom dressed me up as a clown. I am really not that silly. The man from the newspaper took my picture.